But there’s probably a reason Aunt Mary is keeping that family recipe a tightly held secret. That’s because when you realize the average candy-coated Sweet Potato Casserole likely contains more than one stick of butter, a hefty amount of heavy whipping cream, and who knows how much refined white sugar, you might think twice before digging in. The good news: All of these traditional ingredients aren’t necessary to create an amazing Sweet Potato Casserole. If you’re looking to wow the crowd, keep it simple. 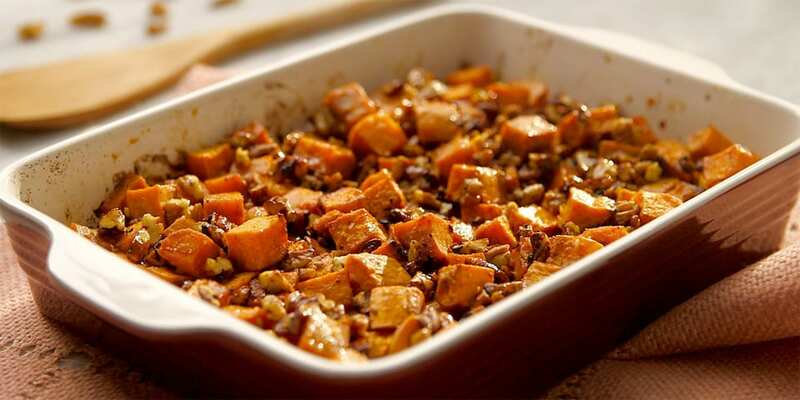 This Sweet Potato Casserole recipe from 21 Day Fix creator Autumn Calabrese and her brother, chef Bobby Calabrese, uses a handful of simple ingredients to create a decadent glaze which perfectly accents this naturally sweet vegetable. Autumn and Bobby run through this simple and delicious recipe while giving important tips along the way. For example, did you know a great way to cook sweet potatoes evenly in the oven is to keep your dice as close to the same size as possible? A bit of fresh ginger can give this recipe that extra flavor boost, but if you have fresh ginger go for it; if not, ginger powder works well, too. While this is a classic holiday side dish that’s ideal for Thanksgiving, it’s also an awesome meal prep dish that you can make any time of year. As Autumn points out, this dish “tastes like candy,” so it’s a great way to satisfy your sweet tooth all year long. This will certainly be the easiest sweet potato casserole you’ll ever make!